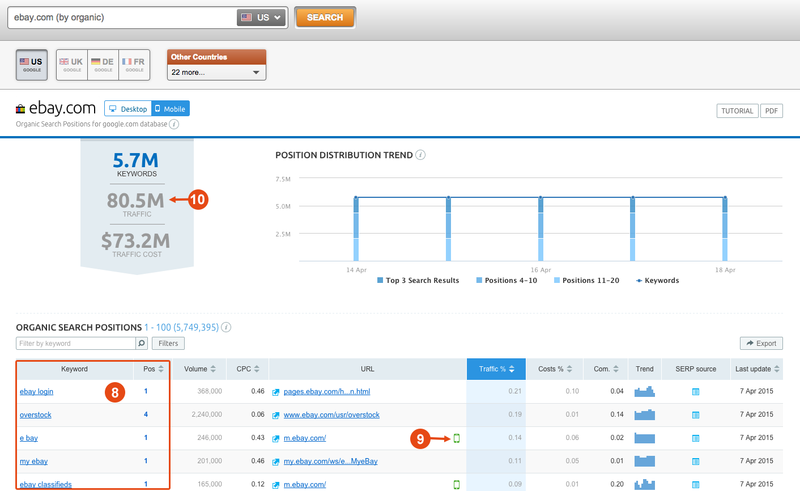 SEMrush launches mobile data analytics! Google’s mobile algorithm update is now the hottest topic in SEO. While adapting your website to mobile-friendly guidelines, you are probably wondering: Which of your website’s pages are mobile-friendly and which of them aren’t? Is there a difference between mobile and desktop search results? What is your website’s mobile search visibility? Today we are happy to announce the launch of mobile data for Organic, Advertising and Keyword Research reports! The new SEMrush Mobile Analytics Data help you find answers to your questions, quickly spot areas where your website could be more mobile-friendly, and fix them. You can also evaluate how mobile-friendly your competitors’ sites are. To check a website’s mobile friendliness, go to SEMrush Overview, and enter the website’s name. At the top of the report, you will notice a selector (1) that allows you to switch from desktop data to mobile data. Click the appropriate icon to view mobile analytics data and display a website’s visibility on mobile devices. The Mobile Performance widget (2) shows the ratio of your website’s URLs that appeared in SERPs with the label “mobile-friendly,” to those without it. The Search Performance graph (3) shows the number of keywords a website is ranking for in Google’s top 20 mobile organic and paid search results. The Position Distribution chart (4) shows the distribution of keywords that a website is ranking for in Google's top 20 mobile search results. The results are grouped by “mobile-friendly” and “mobile-unfriendly” criteria. You can also see your top keywords (5) and top competitors (6) in mobile search. You can see similar data for paid search results (7). To see how a website is ranking in mobile organic search results, go to SEMrush → Organic Research → Positions. This report lists keywords for which a website is ranking in Google's top 20 mobile search results, and the domain’s position for each of them (8). URLs that are labeled “mobile-friendly” in search results will be marked with the mobile phone icon (9). The high number of webpages without this icon should be considered as a warning, because your website can be penalized. To avoid penalization from Google’s and improve users’ mobile search experience on your website, you should optimize your webpages according to mobile-friendly practices. You can also check Mobile Paid Search Data and Mobile Keyword Research Data. Attention: Mobile search reports are currently in beta. Metrics like Volume, Traffic, Traffic Cost, Costs % are calculated based on the desktop keywords’ metrics, and marked in the color gray (10). These metrics will be updated with values for mobile search. We hope that the new SEMrush Mobile Search reports will help you make your website 100 percent mobile-friendly and boost your mobile SEO! We’d love to get your feedback! If you have any comments or suggestions, please send them to [email protected]. 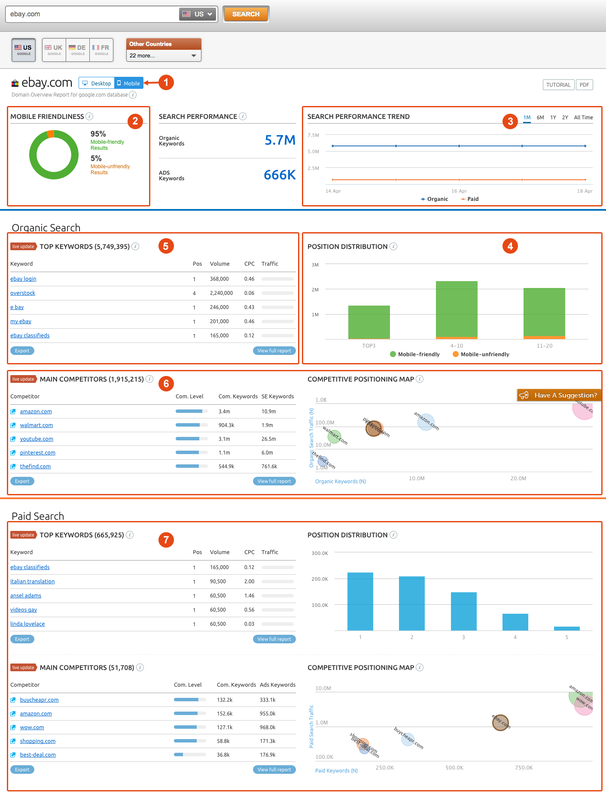 Pass your mobile-friendly test with SEMrush Site Audit!